You load a webpage with their web browser app and start highlighting the parts of the page you’d like to extract. Int3rhacktives has a nice How to scrape data without coding? A step by step tutorial on import.io if you want to find out more. Once you have the data you want extracted import.io continue to try and keep the bar low allowing easy data download in various formats including .csv. and if you want to use live data there are example itegrations for Excel, Google Sheet and other programming languages. Looking more closely at the Google Sheet integration import.io document a method that uses their REST API’s HTML table output which is then wrapped in a Google Sheet importHTML formula e.g. 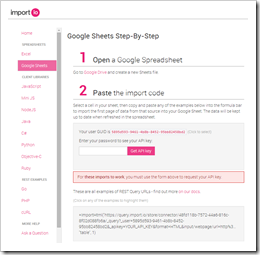 I’m a big fan of Google Sheet ‘import’ and have some tutorials on these. The ‘import’ formula are useful for quick results but not appropriate if you need to do additional manipulation or integration into other automated workflows. import.io do have a number of client libraries and code examples you can look at to address this but the one I thought was missing was one for Google Apps Script. One of the great strengths of Apps Script is it’s easy to create time-based routines to pull and push data around as and when needed. So based on import.io’s php example here’s what it would look like in Google Apps Script. If you’ve already got Google Apps Script/import.io integrations I’d love to hear about them. Hopefully I’ll follow-up this post with an example automation to illustrate what is possible. support is free with import.io, try pinging [email protected] for help. Previous Post: Learning Analytics in Education and a data dogma?